Photo by Larry Naunheim, Jr.
Agatha Christie is one of the best-known mystery writers in history. Her novels, plays and the film adaptations of those plays have provided the basis for many popular conventions in the murder mystery genre, and the whole idea of a classic “whodunit” set in an ornate English country house with a cast of disparate characters and a dramatic reveal of the culprit is irrevocably associated with Christie. 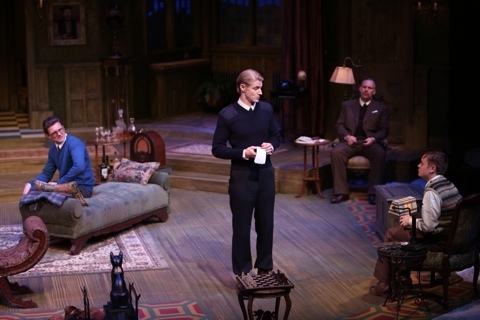 The Mousetrap is one of her best-known plays, famous for its plot as well as the fact that the original production has been running in London’s West End since 1952. Since then, the play has been performed many times around the world by professional and amateur companies as well as schools. For a play that is so well-known and oft-performed, it must be a challenge for a professional company to present it with a sense of energy and immediacy that would still make it exciting for today’s audience, and the Repertory Theatre of St. Louis has done just that with their excellent new production. The story is set in one of those cavernous and characterful old English houses, Monkswell Manor, which is being opened as a guest house by young couple Giles (William Connell) and Mollie Ralston (Ellen Adair). On the day their first guests are to arrive, they are greeted by an inconvenient snowstorm, and the news of a murder in nearby London, committed by a person with a vague enough description that it could fit just about anyone, including the new residents of Monskwell Manor, all of them possessing unique quirks and secrets of their own. When a determined young police sergeant arrives on the scene announcing that there may be a murderer in their midst, the mystery begins to build, with fear, suspicion and surprising revelations abounding, with Christie’s requisite clues and red herrings along the way, all leading up the the inevitable big reveal. Christie’s larger-than-life characters are richly drawn in this production, played with energy and panache by this universally superb cast. There’s the excitable and odd young Christopher Wren (Sean Mellott), the cranky and fastidious Mrs. Boyle (Darrie Lawrence), the dependable Major Metcalf (Michael James Read), the guarded, secretive Miss Casewell (Tarah Flanagan), and the mysterious unannounced latecomer Mr. Paravicini (Larry Paulsen). Added to this mix is the increasingly determined Detective Sergeant Trotter (Christian Pedersen), who is intent on finding out all he can about each and every person in the house, with varying degrees of cooperation and wariness from the assembled guests. I thought the characters’ relationships were particularly well-played, with warm affection and growing uncomfortable questioning between Giles and Mollie, Mollie’s unexpected bond with the insecure Wren, Mr. Paravicini’s stirring up mischief and Trotter’s constant questioning and challenging. The characters drive the plot as the evidence is presented gradually and efficiently, and even though I had seen The Mousetrap before years ago (so long ago that I didn’t remember the ending at first), this cast still managed to make the reveal dramatically satisfying. Special credit goes to the performer playing the murderer (no, I won’t say who it is) for fooling me, even though I had seen the show before, until very close to the final revelation when I finally remembered how it ended. The casting for each character was ideal, and the play’s suspense and drama as well as its elements of broad comedy are well played. Some of the standouts for me were Mellott, Adair, Paulsen and Pedersen. Mellott especially held my attention whenever he was on stage, with all his nervous energy and eagerness, and the charm of his developing friendship with Adair’s sympathetic Mollie. Paulsen was also a delight as the colorful, dynamic and enigmatic Paravicini, and Pedersen brought just the right blend of charm and dogged determination to the character of Trotter. The entire cast is to be commended, as well. These characters could easily become caricatures, but this wonderful cast has managed to bring out their humanity rather than just portray them as a collection of quirks. The set for this production, designed by John Ezell, and the richly appointed costumes by Dorothy Marshall Englis were meticulously detailed and added to the character of this production. 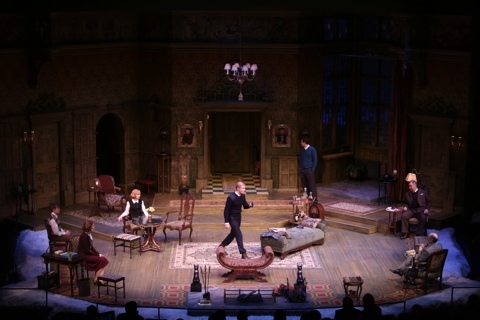 The setting of England in the 1950’s is effectively achieved, and the staging is clever and ingenious, positioning the audience behind an invisible wall in the Great Hall of Monkswell Manor, providing just the right angle to experience all of the action and unfolding intrigue. Also, while this couldn’t have been planned, the cold, snowy weather on Opening Night certainly added to the atmosphere and helped make the situation of this group of snowbound individuals all the more believable. Agatha Christie’s mysteries are so well-known and oft-imitated that they could very easily be viewed as a collection of worn-out cliches, and this production very effectively avoids that trap. The real thrill here is in how this precisely executed production is able to ensnare its audience and keep our attention from start to finish. I personally have a sense of nostalgia about Agatha Christie shows (I grew up attending annual productions at a local dinner theatre with my mother), and I’m sure many others who see this play will have their own associations with Christie’s plays, but this production’s strength is that it’s able to both celebrate the long Christie tradition and make it a real, fleshed-out story at the same time. It’s a thoroughly enjoyable evening of theatre.